Sometimes when I travel, something catches my eye and an obsession is born. It usually doesn’t take long to convince Ann to go along when I explain what we’ll be doing. For instance, one of these obsessive desires took us to Tabacon Hot Springs in Costa Rica where we could sit, surrounded by the beautiful rainforest, basking in the pure volcanically heated mineral water that freely flows off Arenal Volcano. Another took us to the clear blue waters of Maho Beach where we had an amazing view of airplanes approaching St. Maarten’s Princess Juliana airport. 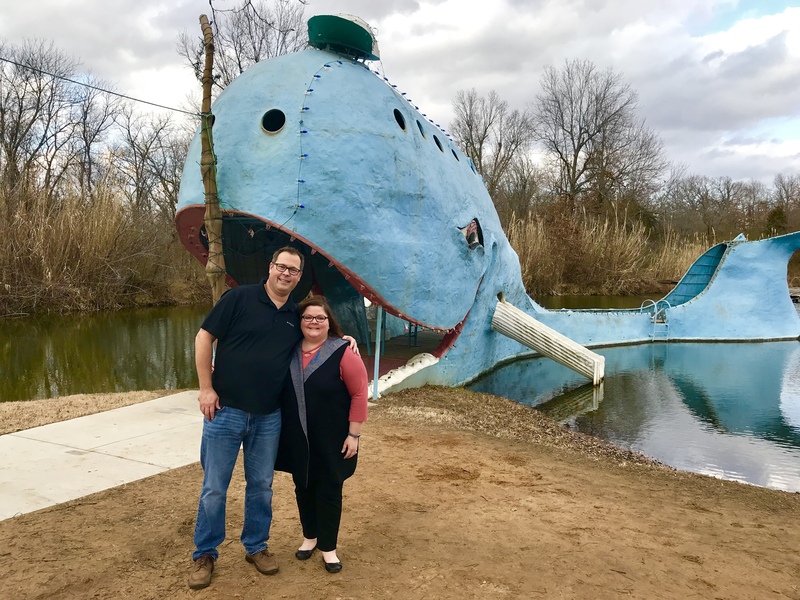 Then, on our recent first-ever trip to Tulsa, I convinced her that we needed visit a giant blue whale with a hat on its head. Steve and Ann prepare to enter the whale’s mouth. When we left for Tulsa, we’d asked readers to suggest things we should see and do while there. We were overwhelmed by the number of amazing recommendations for meals, museums, and shopping we received. 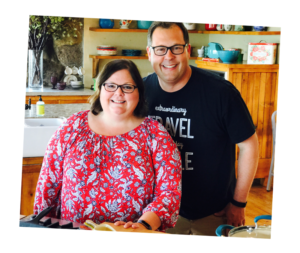 We knew that our limited time in Tulsa would be packed full of activity and we would have to carefully choose what we would do. So when I read Jessica Voelker’s suggestion that we should go see the “Blue Whale,” everything else obviously faded to a distant second. I knew my choice for what I wanted to see. I mean, it’s a giant blue whale in a small pond in the middle of Oklahoma. Who wouldn’t want to see that? Our obligatory pic at The Blue Whale of Catoosa on Route 66. 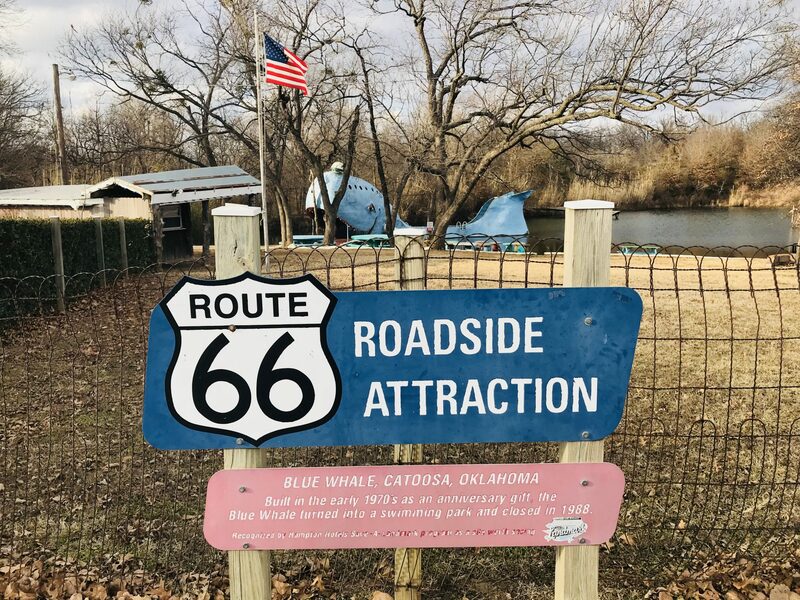 Located along old Route 66 near Catoosa, Oklahoma, you’ll find a huge, smiling blue whale sitting peacefully in a pond. It has been there since the early 1970’s, tiny cap perched on its head, when Hugh Davis built it for his wife, Zelta, as an anniversary gift. Frankly, I think that was a pretty gutsy anniversary gift as I can’t imagine Ann’s reaction if I gave her a big whale, but Hugh knew his wife loved whales and it was a big hit. A walk through the whale’s smiling maw brings you out on a dock over the water. For years, locals and travelers alike came here to swim, jump off the whale and slip down the slide on its side. Apparently, as the whale’s popularity grew, Hugh and Zelta also built a replica of Noah’s Ark which they used to hold a small zoo of other animals on the property. 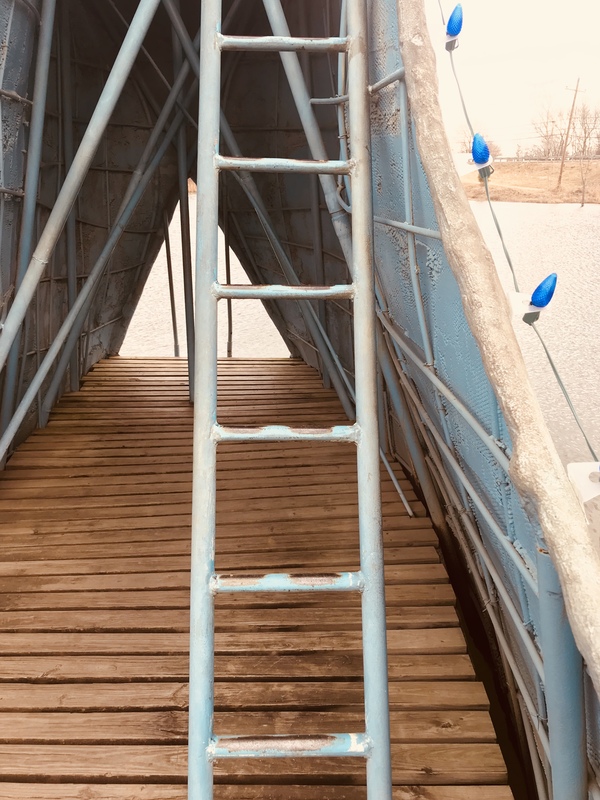 It was fun to think about the thousands of kids who climbed these steps so they could jump into the water from the tail of The Blue Whale of Catoosa on Route 66. Eventually, the Davises retired, and the park fell into disrepair. A group of locals got together and brought the property back to life, if on a limited scale. Today, there is a small information booth that is open on weekends where you can buy a postcard. To our knowledge, swimming is no longer allowed, but that doesn’t mean this pop-culture landmark that has been featured on the Food Network, and on the television show, American Pickers, should be missed. Instead, take a few minutes to pull off the road and spend a little time listening to the echoes of summers past. 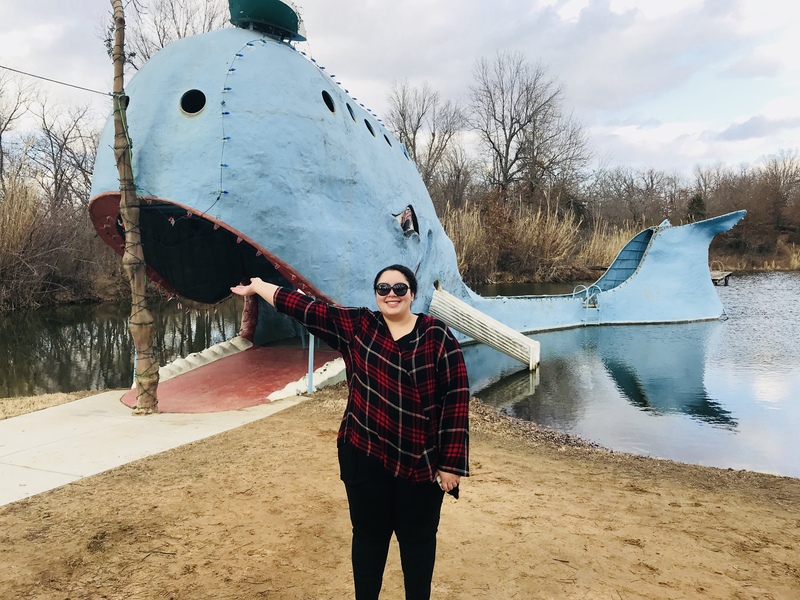 Our daughter, Meghan, at The Blue Whale of Catoosa on Route 66. And of course, take your obligatory photo with the blue whale. 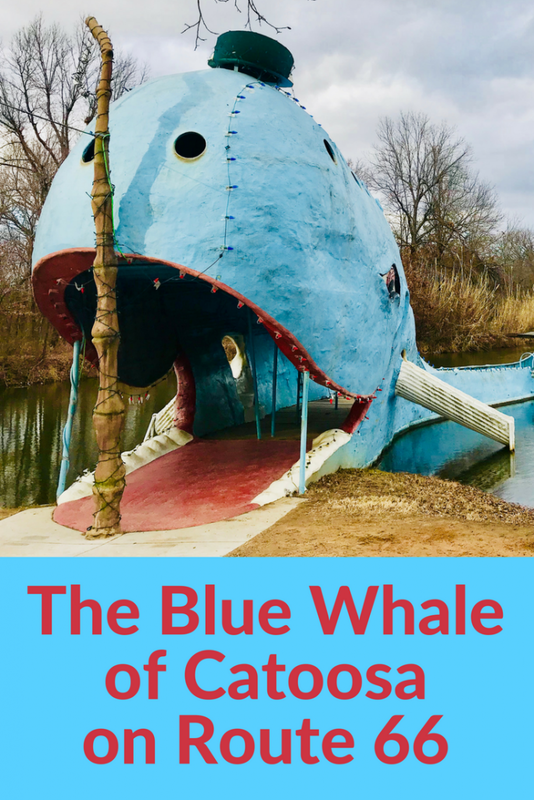 Have you been to see The Blue Whale of Catoosa? What did you think? Let us know, we’d love to hear from you.